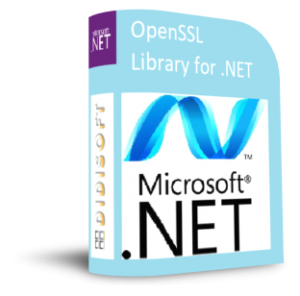 DidiSoft OpenSSL Library for .NET is a .NET software library that offers a set of classes providing simple API methods for encrypting/decrypting data in formats compatible with the popular OpenSSL library. The library is intended to be used by C# and VB.NET software developers, but could also be utilized by any other language implemented on the .NET Framework. RSA cryptography with RSA key as .crt/.cer X.509 certificates, PEM and DER encoded keys and .pfx/.p12 (PKCS12) encoded private keys. X.509 certificates creation and Certificate Authority implementation.